The Iowa Freedom Summit, hosted by Iowa’s principled limited government constitutional conservative Congressman Steve King and Citizens United, featured some great (and some not-so-great) speeches by leading Republican governors, senators and potential presidential candidates. Wisconsin Governor Scott Walker received a lot of notice for his remark that seemed aimed at the Republican Party’s Capitol Hill leadership, "If you are not afraid to go big and bold, you can get results… The voters will actually stand up with you." But the speaker who caught our attention was Senator Ted Cruz of Texas. 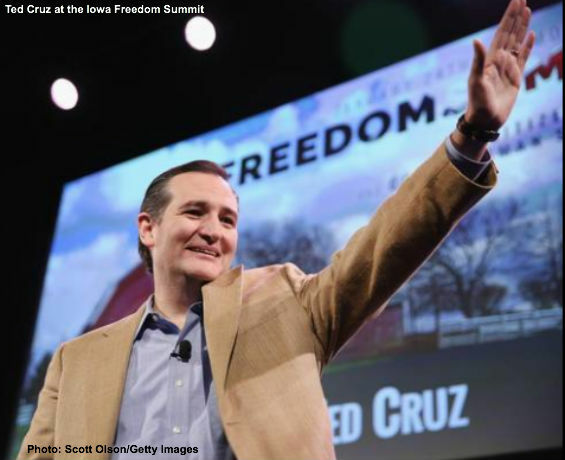 Cruz told summit attendees that they need to use the first in the nation Iowa Caucuses to force Republican candidates to prove they're conservatives, not just accept their words that they are. "In a Republican primary, every candidate’s going to come in front of you and say, 'I’m the most conservative guy that ever lived,'" Cruz told the crowd. "Talk is cheap," Cruz said. "The word tells us you will know them by their fruit." Every Republican presidential candidate since Barry Goldwater, save perhaps Gerald Ford, has run as a conservative. Even George H.W. Bush, Bob Dole, John McCain and Mitt Romney attempted to sell themselves as conservatives. But anyone who looked past their rhetoric and had taken a good look at their records would recognize that there was little in the way of conservative accomplishment. And "conservative accomplishment" is in large measure why Cruz drew a thunderous reception from the crowd. The audience laughed loudly at his jokes and booed his mentions of Democrats because they recognize Cruz isn’t just talk – he has actually fought for their conservative principles. At a post-speech news conference Cruz sidestepped a question over whether former Florida Gov. Jeb Bush — who has said he's exploring a run for president but did not attend the event — is a "constitutional conservative." While Senator Cruz was being (perhaps too) diplomatic we will help fill in the record on Jeb Bush and others who would like to sell themselves as “conservatives” without having the record to prove it. Ted Cruz is right, if Republicans want to win the White House in 2016 they must nominate a candidate who can prove he or she is a conservative, running Big Government Republican candidates like Jeb Bush, Mitt Romney, Mike Huckabee or Chris Christie is a sure path to disaster. A candidate with real limited government constitutional conservative principles and a record that appeals to “the country class” needs to emerge, and emerge fast, before Jeb Bush and the Republican establishment define the race in terms that will drive grassroots limited government constitutional conservatives away from the GOP, perhaps forever. To watch Senator Ted Cruz’s speech in its entirety – and it is well worth the few minutes it will take – click this link. Submitted by lingogirl on Wed, 01/28/2015 - 15:49. The time has come, without further delay, for conservatives who really mean business to UNITE NOW behind Cruz. There may be others who would be great presidential candidates, whose ideas might match our own to perfection, but we must be honest. The one, single, candidate who has the passion, leadership, courage and principles we need now is Cruz. He stands out like a neon sign on a windswept prairie. You can't miss him. I like Jindal. I like Mike Lee - a lot! Many candidates would be good presidents, but we must not linger on that - we cannot afford to have fun imagining "our" candidate going on to the presidency. Not unless we all focus on the SAME candidate. For the last several presidential years we have seen the same play: 10 - 14 excellent men and women have rallied their little armies in pursuit of the nomination. RINOs have scrounged up one or maybe two and one of them dropped out early, throwing in with the other. In the end a minority-plurality-elite defined the party against the wishes of the majority grassroots - who were busy campaigning for Huckabee, Palin, Perry, etc, etc, etc, ad nauseum. Meanwhile we got Bush, we got McCain, we got Romney. They ran unopposed, virtually, as RINO candidates within the party. But today we have a new scenario - one which could play very well for a conservative victory (and if a conservative is nominated he WILL WIN in 2016). We have a widening field of egos in suits vying for the nomination: Jeb Bush and his followers think he's entitled - he has inherited the RIGHT. Mitt Romney also feels it's his privilege. Now we have Chris Christie who thinks he's earned the right to represent us (why, I can't imagine, but he does). If these three stay the course . . . and if we, as conservatives refuse to take the bait and run a dozen candidates - if we consolidate our forces behind ONE person - we can win the nomination this time and go all the way to the White House in 2016 - and save America. If we do what we usually do we will LOSE. Guaranteed to lose. And with our loss the future of our country. Is that what we want? And the one person who has been unshakable, whose priniciples have guided his votes and stands on every issue whose message is resonating loudly with the people of America - is TED CRUZ. What do we know so far? He has stood firmly for the Second Amendment. He has stood against amnesty. He will work hard to balance the budget while shrinking the size of the federal government. He is working hard to eliminate the IRS. He would be a strong and highly respected leader on the world stage. If other countries don't "love" him they will be certain of where he stands at least. He will stand with Israel against aggressor nations in the middle East. He will stand strongly for our Bill of Rights and our Constitution. He will defend our borders. He will support our free-market economy. What more can we expect of any of our other "favorites"? My own "favorite" might be Mike Lee. Mike Lee is a great senator and a fine leader. But how many people would recognize him if they saw him in a supermarket or on the 6:00 news? What about Jindal? A great governor, a great man, someone whose prinicples are strong and steady, a man of courage who is not afraid to speak the truth. Can he run a national campaign? Maybe, but maybe not this time around. He is someone to keep in mind. But who REALLY WANTS this? Who has the "fire" to pursue it with the energy and passion we desperately need to win this vital campaign? Let's all quite dreaming of our favorite. I'm asking all true conservatives to put the dreams aside for a time when the outcome is not so crucial. Wait for that perfect world. Ask yourselves this: what does my candidate (Palin, Walker, Jindal, etc.) stand for that Cruz does not? What will he or she do that Cruz will not? How is "my candidate" better than Cruz? Unless you have some very important differences with Cruz, let's ALL support HIM. And imagine a nomination process where we have this field: Cruz vs. Romney vs. Bush vs. Christie. Who will win? I think you know. But look at this: Cruz vs. Bush v. Christie v. Romney vs. Huckabee vs. Jindal vs. Palin vs. Lee vs Paul vs. Perry vs. . . . well, you see what I mean. Submitted by sdofaz on Tue, 01/27/2015 - 21:09. The last statement in this article says it all because it acknowledged the possibility of another party. That needs to be done and soon if the actual conservatives in this country are to compete in this next presidential election. People are leaving the democrats in droves only to be stopped by the GOP old boys club. There is a base in this country and it needs to find its place outside the republicans or the democrats. Just do it and the people will come. Submitted by vtdelacy on Mon, 01/26/2015 - 13:04. The fact is Senator Cruz has already abundantly proven his conservative credentials and is the best man suited to be run for the Presidency in 2016, period. He convinced me when he stood on the floor of the Senate to speak out eloquently against the Obama-non-Care bill vehemently opposed by fully 75% of the electorate and 89% of physicians at the time of it's passage. He could be counted upon to follow through on his promise to push for full repeal of every word of that deadly bill currently poised to kill both the economy and the electorate. Ted Cruz for President in 2016, to the rescuing of the American way of life! Submitted by hrh32 on Wed, 01/28/2015 - 14:13. Then he will have proven that he can administer conservative principles. Not just talk about them, however eloquently. And not just vote on them. Full disclosure: Governor Palin is my first choice. If she doesn't run, Governor Jindal is my second.